Geographic maps are effective communicational tools to support decision making, to promote multidisciplinary approaches to sustainable development, and to enhance the understanding of geographic information. FAO GeoNetwork's purpose is to improve access to and integrated use of spatial data and information. GeoNetwork allows to easily share spatial data among different organizations and users. FAO GeoNetwork provides access to readily available interactive maps, satellite imagery and related spatial databases maintained by FAO and its partners (important partners are WFP, UNEP, and OCHA). At present the project is widely used as the basis of Spatial Data Infrastructures around the world. The project is part of the Open Source Geospatial Foundation (OSGeo) and can be found at GeoNetwork opensource. FAO GeoNetwork allows to easily share spatial data, including those derived from satellite imagery, among different organizations and users. By combining various layers of information decision makers and planners are able to make better informed decisions for sustainable development of land and water systems. 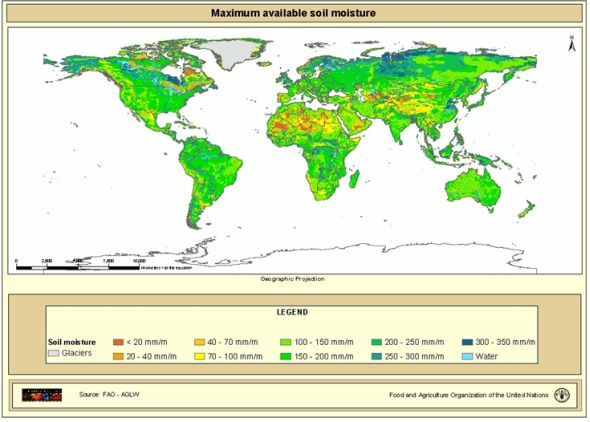 The datasets behind these available maps can be downloaded and opened in Google Earth, for example, see below a detail of the global dataset on maximum available soil moisture. GeoNetwork provides mature technology. It is used by FAO and its partners in problem analysis, planning, decision support, and implementation. Datasets behind the maps can be downloaded and viewed and analyzed in Google Earth which all can be downloaded free of charge. Maps are provided at the global scale, but can be zoomed into the local scale (depending on the grid scale of the data set). Datasets and maps can be instantly downloaded, viewed, and analyzed. LAFAO GeoNetwork maps and datasets are open source available online.